This post has been contributed by Kathleen Stormont, Communications Specialist with the Stanley Park Ecology Society (“SPES”). I have been following SPES since I moved into the West End over a decade ago and I have been a member for four years. I wanted to offer the team an opportunity to share their news, events, and work so I have created “SPES Saturday” where they contribute and share stories with my audience once a month. Before Lost Lagoon was artificially blocked off from Coal Harbour in 1916, Stanley Park was an island. Tides washed into the lagoon from Coal Harbour and a stream ran from its western end to English Bay. The lagoon, an intertidal mudflat at low tide (hence its “lost” reference), provided rich clamming grounds for local First Nations, some of whom dwelled in villages dotting the island. The largest village site, Xway Xway (also known as Whoi Whoi), hosted potlatches for up to 2000 people where present-day Lumberman’s Arch is located. 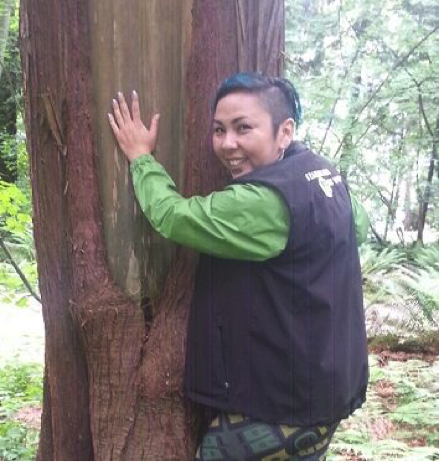 the “tree of life”, a western red cedar in Stanley Park. On the traditional territory of these Coast Salish peoples, the Stanley Park Ecology Society (“SPES”) is proud to present a series of authentic indigenous walks with experienced First Nations guides this late summer. 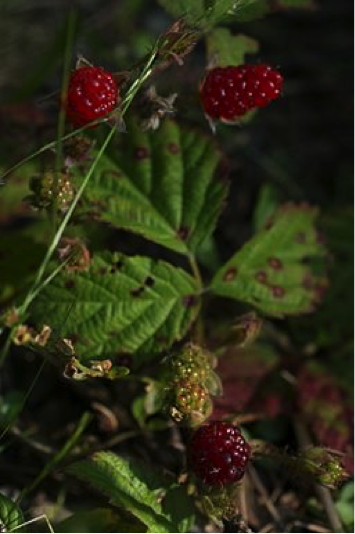 Walking in their ancestors’ footsteps, guides like Lauraleigh Paul, a Coast Salish, Interior Salish, and Carrier First Nations woman, is bringing the traditional knowledge of local medicinal and edible plants alive for tour participants. “The wealth of knowledge that has been carried for thousands of years through our oral tradition is now blessing us through this tour,” says Lauraleigh, known also by her indigenous name, Yuxweluptun’ aat. After participating in one of Lauraleigh’s tours, Vancouver Park Board Environmental Planner Alan Duncan tried Lauraleigh’s traditional collecting techniques on wild huckleberries near his family cabin. To his delight, what used to take him two days of collecting, took two hours. In gratitude, Alan presented Lauraleigh with the fruits of his labours: a scrumptious huckleberry pie. Alan’s gift could be observed by some as emblematic of the spirit of reconciliation between First Nations and Canadians. “We’re sharing the knowledge …. It’s an exciting time to be here,” says Lauraleigh. 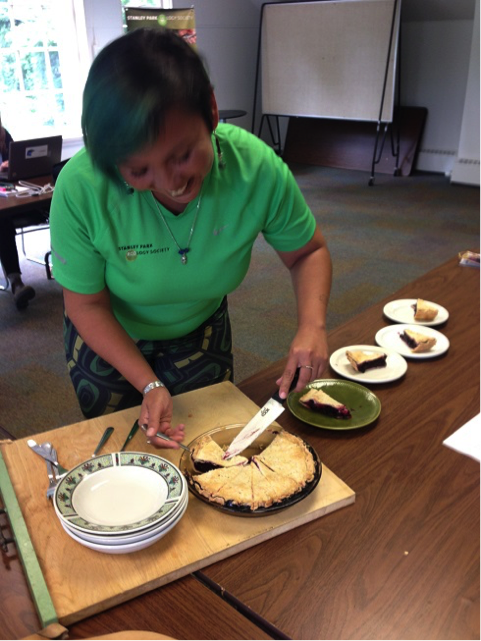 Lauraleigh shares her wild huckleberry pie with SPES staff. 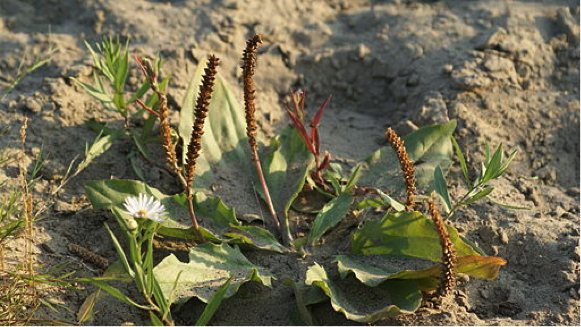 To join SPES’ “Indigenous Plant Use” walks, visit the Events Calendar webpage or call SPES at 604-257-8544. Walks run throughout August and, owing to their popularity, may be available to schools and other groups this September. Update: Walks are available on Saturdays in September. This post has been contributed by Kathleen Stormont, Communications Specialist with the Stanley Park Ecology Society. If you want to support a non-profit organization that makes a difference for wildlife and people in Stanley Park, please make a donation or become a member of SPES. For more information visit the Stanley Park Ecology Society website.